Welcome to the plush bayou! 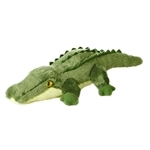 You'll find all kinds of alligator stuffed animals here in the swamp country of StuffedSafari.com. Our stuffed alligators and plush alligators are ready to turn everyone they meet into a yummy snack, I mean, lifelong friend. If Swamp People has taught us anything, it is that gators are to be admired and respected. 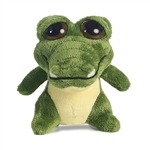 Our stuffed gators and plush gators would appreciate your respect and if they don't get it then they will surely bite, I mean work, hard to earn it. Don't tell the plush gators, but most of them are actually pretty cute. They like to think that they are big and scary like real alligators but if you stumble upon one of these alligator stuffed animals sunning themselves by your pool you will most likely pick it up and hug it. It's doubtful that you'd do the same to a real alligator unless you're a lifelong resident of Bayou Sorrel or a raving lunatic. Now it's time to fire up the airboat, bait some lines, and catch some nice stuffed alligators and plush alligators.